An order cost me $1. If you're looking for something new, there's not much of that here. The Triple Melt Nachos is one of those limited-time Taco Bell items that offer a slight tweak to what's already on the menu but for a discounted price. Rather than a plastic plate, my nachos came in a cardboard clamshell box similar to what you might get a hot dog in. I'm not sure as to the reason for the change but the amount of food looked to be about the same. For those who just want meat and cheese, you'll get that front and center here. There was enough beef and cheese in my order to dip every chip. The three-cheese blend was so very mild that it just added a generic creaminess and a slight bit of gooey melt. While I enjoyed it for the most part, I did find myself wishing just a little that there was a bit of bite or tang though. 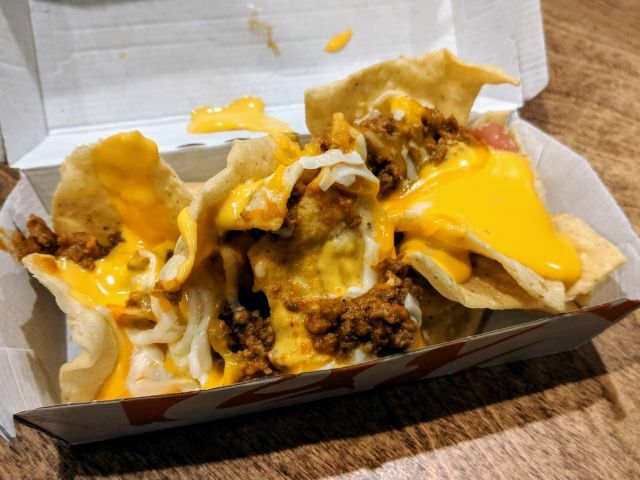 When it comes down to it, Taco Bell's Triple Melt Nachos make for a nice, balanced combination of beef, melted nacho cheese, and chips on the cheap. If you find yourself hoping for a bit more "oomph" without paying extra, I'd suggest grabbing some hot sauce packets.